Banking on Windows Phone will get a little more painful this weekend, as Bank of America pulls its Windows Phone app on Sunday. 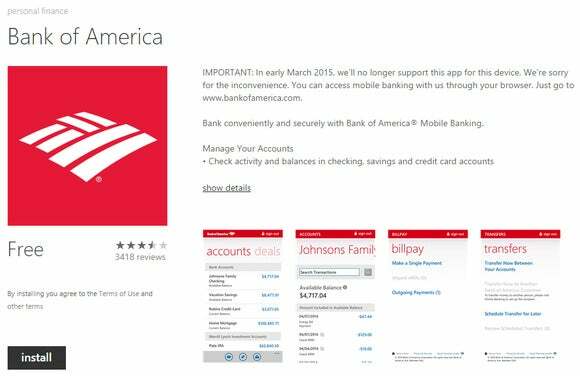 On March 1, Bank of America will no longer support its Windows Phone banking app—or its Windows 8.1 app, for that matter. “IMPORTANT: In early March 2015, we’ll no longer support this app for this device. We’re sorry for the inconvenience,” a note on the Windows Phone app page reads. Bank of America did not respond to a request for comment. It issued an update to the BoA Android app just two days ago. What this means is that Windows Phone users have had a steadily dwindling number of banking and payment apps to use on the platform. Chase no longer supports its Windows Phone app, either. 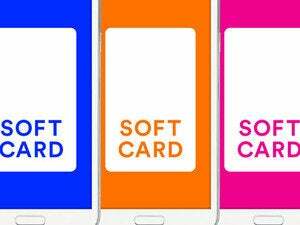 And Softcard said this week it would no longer support Windows Phone after Google’s decision to acquire its payments technology. There are two problems here. First, the banking apps themselves are going away; and second, the remaining apps don’t appear to specifically support adding credit-card or debit-card information to the Wallet itself. That’s the case for Wells Fargo, for example, which plans to continue offering a Windows Phone app. With the Bank of America app, there is a backup plan: Use the web, which is a perfectly valid solution for a desktop Windows user. For phones, however, it can be a bit trickier, with only basic functions supported by the web app—it’s almost certain that Bank of America customers won’t be able to snap a photo of a check, for example, and use optical character recognition to deposit it to their bank. Why this matters: Microsoft’s Windows Phone has been under fire for its app deficiency—the “app gap” separating that platform from iOS and Android. There's the perception that Windows Phone just hasn’t been moving as fast as the other platforms, but it has nevertheless been moving in a positive direction. Discontinuing apps sends an entirely different message—and a very worrying one, at that.